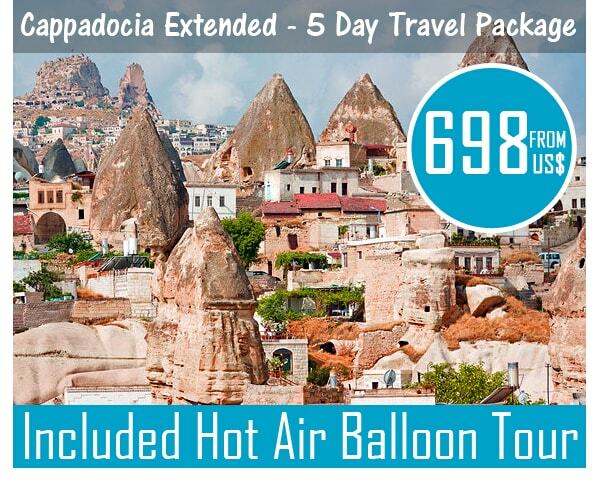 Daily Tours and Travel Packages of Cappadocia. Cappadocia occupies the centre of Turkey, the region between the Black Sea in the north and the Taurus Mountains, between the capital Ankara and the city of Malatya to the east. Famous for its spectacular natural rock formations and valleys, Goreme National Park, as it is known today, is strewn with underground cities, stone chapels, monasteries and dwellings that were hewn out of the weirdly eroded volcanic rock from as long ago as 400 BC. Thousands of years of wind and rain erosion on a landscape of soft volcanic stone topped with hardened larva caps has created a fascinating landscape of rock cones and pinnacles that are known as ‘fairy chimneys’. The Valley of Fairy Chimneys is the most popular area, roughly within the triangle formed by the three main towns of the region, Avanos, Urgup and the main transport hub of Nevsehir. Outside the triangle to the south are the remarkable underground cities of Derinkuyu and Kaymakli, where layers of tunnels and an intricate system of caves hid generations of settlers and sheltered early Christians fleeing persecution. The Ilhara Canyon is another religious hideaway with more than 100 painted churches and about 4,000 dwellings carved into the rock walls or concealed within the cliffs; its river bed and lush vegetation stand in stark contrast to the dusty, seemingly barren land above. Cave dwellings, ancient monasteries and painted chapels are well camouflaged, with entranceways that are barely noticeable among a landscape of perforated cliff walls and rock fissures. Houses of volcanic stone blend unobtrusively into the natural surroundings, pigmented in natural shades of ochre and yellow, to pinks, greys and greens, and many people still inhabit the cones and chimney formations. In tourist towns such as Goreme, delightful little hotels and pensions are built partially into the rock or are housed within a rock cone and offer cave-style rooms. Discover Cappadocia through customized tours in private or small-group tour levels with our excellent local guides! Our tours are ideal for first time visitors as well as connoisseurs. 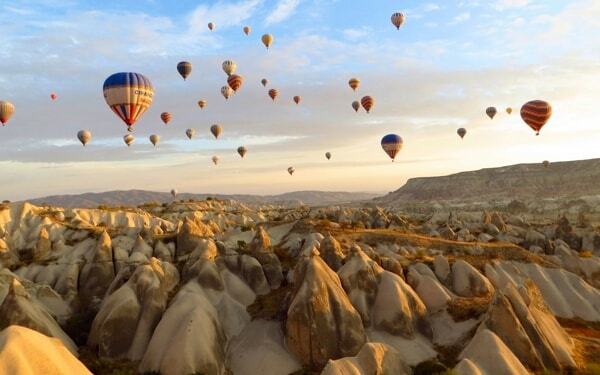 Want to tour Cappadocia? 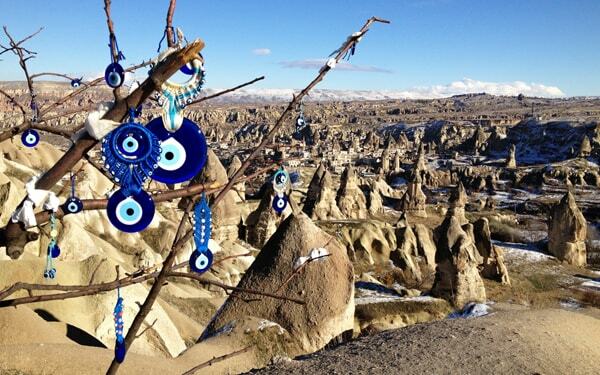 We offer custom and private Cappadocia travel packages with a great choice of cave hotels. We had booked the Cappadocia Private Tour that was operated through Celsus Travel and we couldn't have been happier. Our guide did a fantastic job! He spoke English very well and had a funny sense of humor. We traveled to multiple places but the highlights were Kaymakli (underground city) and the Ihlara Valley. Both incredible places to visit. Our guide had a wealth of knowledge for each place he took us to. You could tell he loved his job and had a passion for Turkey's history. We recommend this company to anyone! We were a group of seven and booked a Cappadocia private tour. Our guide Nedim was a professional with excellent knowledge of the history, culture and the changes in the region. He spoke very good English. In addition to his knowledge, he was attentive to individual needs of the elderly and kids. The tour was perfectly structured so that we had enough rest and sightseeing. We highly recommend Celsus Travel for best of Cappadocia tour. © 2016 Celsus Travel LLC, All rights reserved. registrated at the TURSAB (The Association of Turkish Travel Agencies). The VAT registration number is 2050530425.